The Throwback Mule (celebrating our resident asses) – a ginger and lime kettle soured ale – the perfect combo of citrus and spice! Kettle-Soured Cucumber Mojito – made with our own refreshing Hobbs Farm cucumbers and fresh mint. Blueberry Pie Sour on Cask – a homage to one of our favorite pies featuring our blueberry lactose sour plus all the flavors you love in a cobbler or a crisp. Mixed Fermentation Saison Dry-Hopped with Sorachi Ace – fermented and soured in a pinot noir barrel using a saison yeast. The addition of Sorachi Ace hops adds some nice lemon and herbaceous notes. Not to be outdone, our kitchen always rounds out the fun, bringing you Hot & Sour Soup and a Sour Cherry pastry for dessert! We’ll be featuring our regular brunch menu, too. 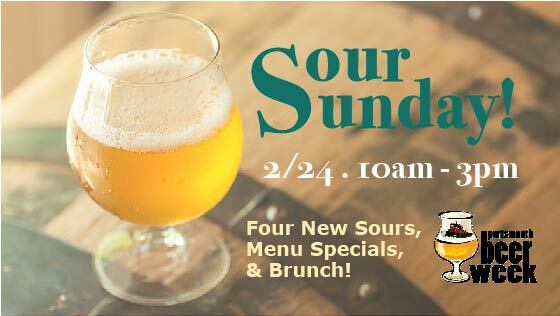 Who knew sour could be so sweet?